Rohmy picks me up at 8:30 to drive me to the garbage dump. 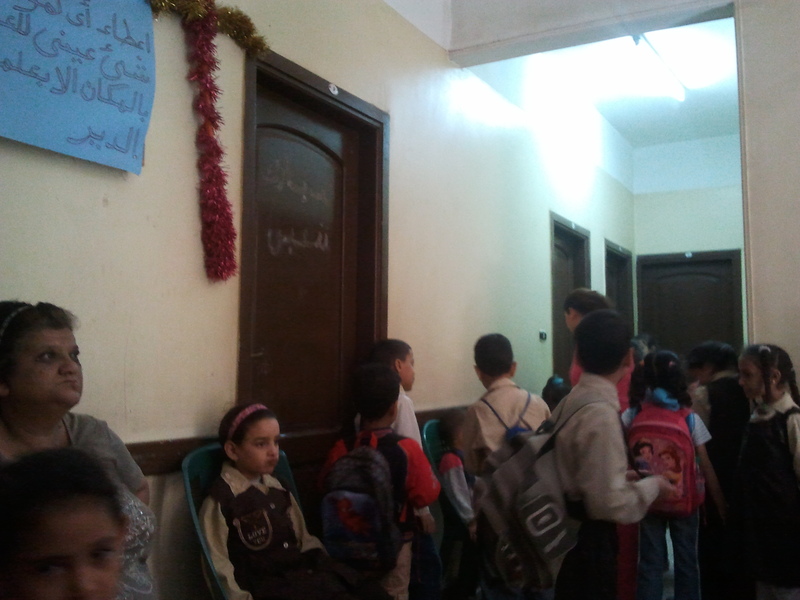 Today I will be working in a Coptic mission school a block away from the garbage dump closest to the Salam Center. He walks me up some dark stairs to the school director. “Nice, isn’t it?” he says. It is nicer than the abandoned hospital/school I saw on Sunday. Actually, I’m getting used to this. It’s not bad at all. The walls are straight, the floors are smooth, there are functioning fluorescent lights along the corridor, and the usual sparkly garlands decorate various areas. Today I see a sparkly crepe paper cross in the entrance to the school. 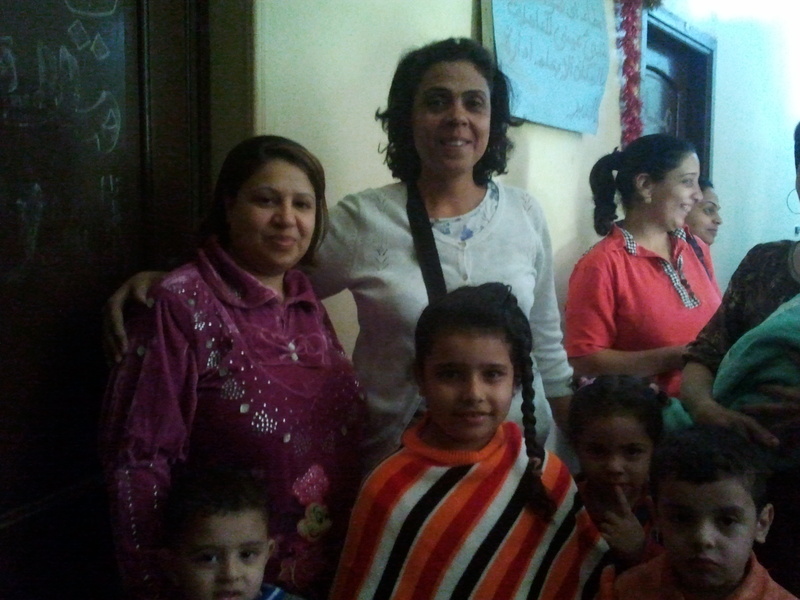 I meet Marleen, the school director, who takes me to the classroom where I’ll be working today. From my experience of schools, I expect Marleen to be authoritarian, and she does look serious, but she’s not strict at all! I’m going to love it here. I have a group of adorable kindergarten kids, and their beautiful teacher, Bosma. Bosma tells me she doesn’t speak any English, but she knows enough to get these kids started. I’ve had images of helping them to identify objects, but I quickly learn they aren’t nearly far enough. They stand up and yell, “Good morning!” in unison when I enter the classroom. And suddenly, they are very shy. I know enough Arabic by now to say to them in Arabic, “My name is Noreen. What’s your name?” But they won’t answer me. One little boy is sitting at his desk, fast asleep. Gradually, I learn each child’s name and then try and get them to say, “My name is….” It sort of works. Then I learn that they have already been working a little on English, learning to print the letters of the alphabet. They know the words, “capital letter” and “small letter”. Some have only gotten to “A”, while others are already as far as “I”. And I thought they could learn to write their names. Perhaps in two weeks they’ll be this far. Some can’t even hold a pencil, while others are very quick. Some write neatly on the page, while others have their letters willy-nilly, all over the page, with huge small e’s, for example, rivaling the capital E’s in size. It is difficult teaching them words like “small” and “large” when I don’t know any Arabic. But fortunately, yesterday at lunch one of the sisters taught me “little spoon” and “big spoon”. So I say something like “kebir” for “big” and “sua’aya” for small. I have great difficulty trying to show one girl how the small “f” is different from the capital “F”. She has huge angular lines for both, or she puts the curve at the bottom of the letter, like a backwards “j”. Gradually, as the hour passes, the children warm up to me, looking into my eyes with long smiles. I adore them! We review the sound of the letters they’ve just written, and say our names once more. 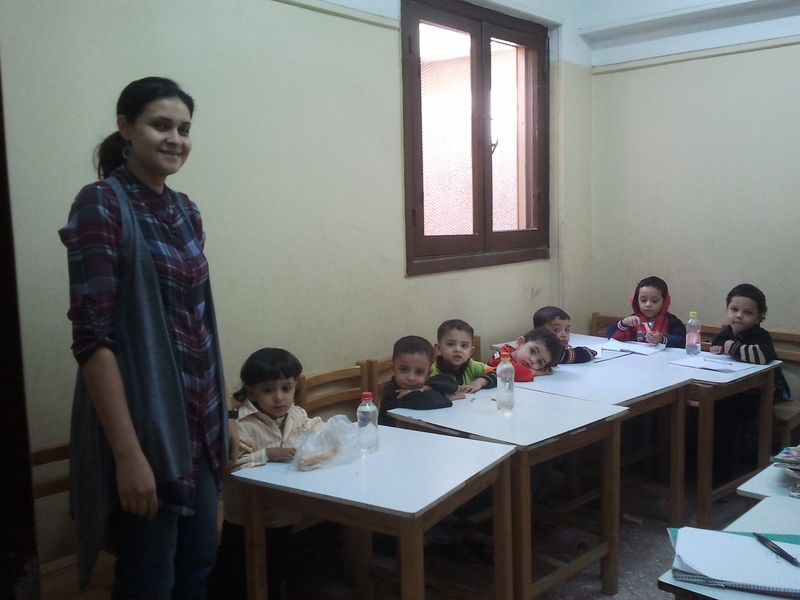 I teach them a few words I’ve either just learned in Arabic myself, like “water” or “bread”, “table” and “chair”. I think I’m finished with the lesson, when another teacher walks into the classroom to observe and says something in Arabic about something we’ve forgotten to do. But she acts so reverent, I figure it must have to do with praying, when she turns off the light and the children stand up, hushed. I somehow surmise that we’re going to do the sign of the cross. I learned that yesterday too at lunch. It’s amazing – each day I’m being prepared ahead of time for what is to follow. I don’t know how to do it in Arabic, but I say the words in English, and the children follow me. Apparently I’m doing it right! “In the name of the Father”, and I touch my head with my right fingers, “and the son”, and I touch my belly, “and the Holy Spirit”; I touch the left shoulder and then the right; “in me”; I touch my heart; “amen”; I fold my hands over my heart in a praying motion. I don’t feel like an imposter, even though Protestants don’t cross themselves. I think this is a very good idea. Apparently there is no more time for me to teach a lesson today. At 10:30 the children from every grade go home for the day, all of them crammed into the lobby as they wait for their parents to arrive. kids waiting to be picked up. kids waiting to be picked up. The little boy who was sleeping now wants a hug. I pick him up and he kisses my cheek. I’m in love! Some of the older students smile at me, and we converse in English. They’re doing pretty well! 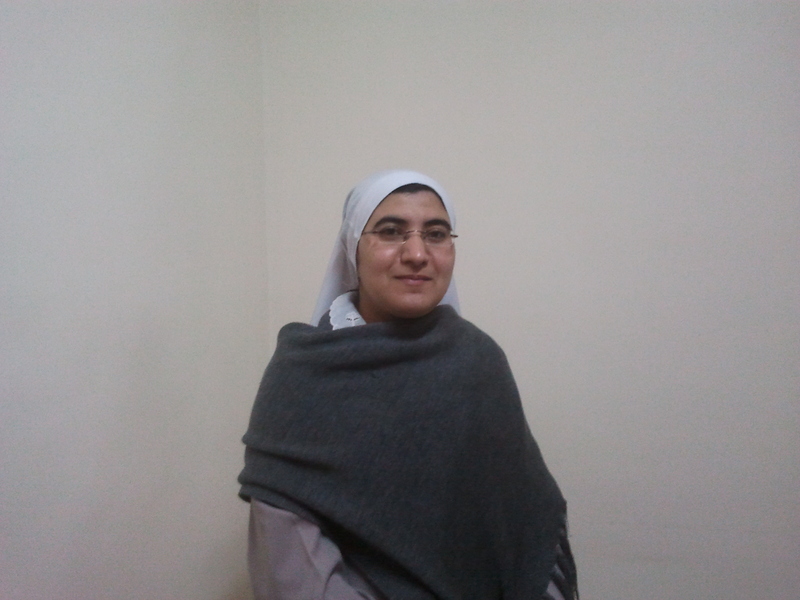 One of the teachers, or assistants, or parents, I’m not sure what she is, but her name is Sabreen, motions to me that she will be walking me back to the convent. Wow! 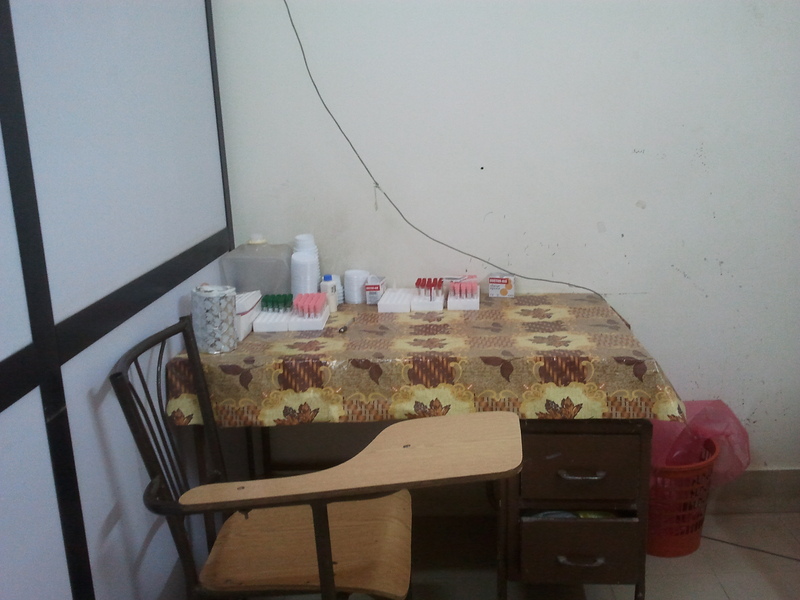 Now I am in a real Cairo neighborhood, outside the locked gates of the convent and hospital. It is an amazing walk. 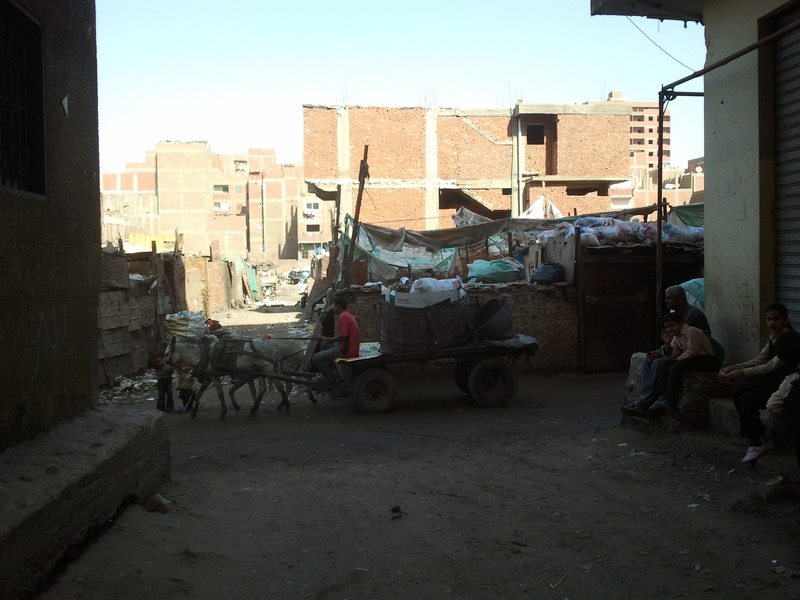 I see the garbage dump, walled in, with trucks and donkeys in the streets, carrying garbage. I see a few people picking through the garbage to sort it. The roads are dirt, uneven, with little hillocks and gullies. Now I see that they are actually in a grid pattern. This must be what New York City looked like 150 years ago. Every now and then there is an indentation with a tire covering it. I ask Sabreen what that is. She holds her fingers over her nose. Sewer. I wonder if it’s in use any more. 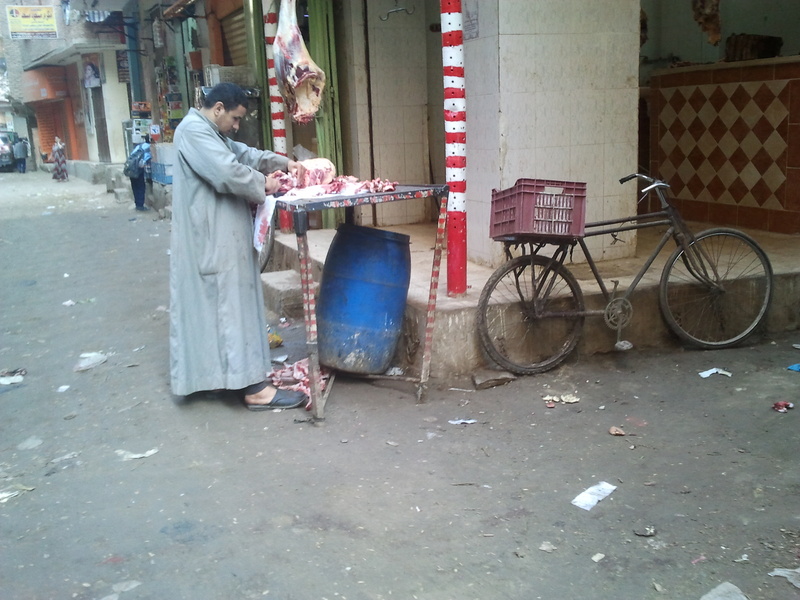 On the sides of the street, we see normal Cairo business. We walk past a butcher, coffee shops, stands where they sell falafel or bread or other baked goods, and little grocery stores with fruit and vegetables or staples such as rice. When we walk along what is a bit broader, like a main road, I see that underneath all the dirt, the road is paved. The unpaved roads are part of the attraction of this city, however. And I am also an attraction to them. 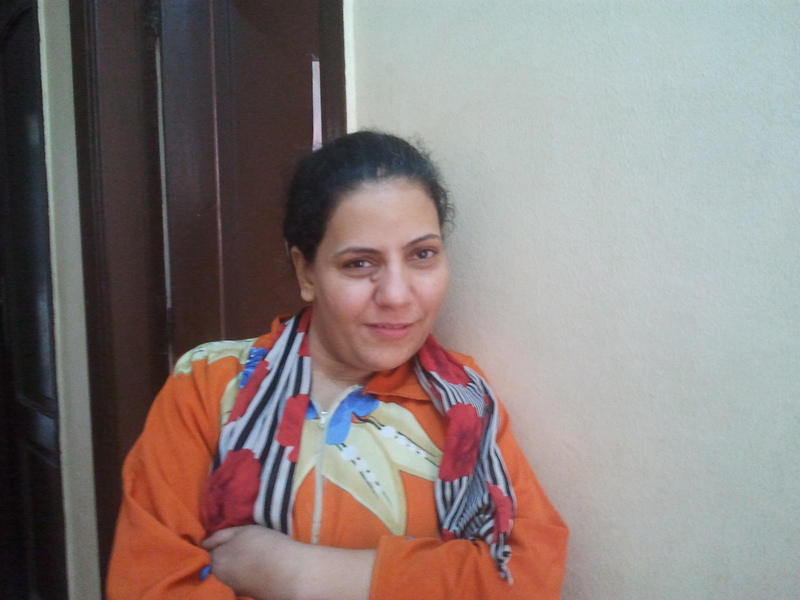 Sabrine keeps greeting people, and I smile and say “Good morning” in Arabic. What an adventure this is! And I get to go back to the school tomorrow. Maybe I’ll get to teach two classes. Won’t that be exciting! I really like Sr. Elleria. If my heart were more open than it is, I could even say I love her. She tells me that talking to me is like talking to an old friend. And I feel the same with her. I like all the sisters very much, but she actually makes the effort to speak English with me. She wants to improve her English. She tells me the convent has a vision, she has a vision too, to receive more foreign visitors like me, and the sisters will have to learn to speak better English. We sit in her lab and chat and chat about so many things. A young man, Aowny, her colleague, comes and joins us. We talk a lot about matters of faith. I can see in his eyes and expression that Owny is also a devout Christian. Elleria’s eyes simply radiate Jesus. They are amazing eyes! They are so full of love and joy. She is also self-confident. Was she always so positive? I wonder how she can work there with Aowny day after day and not fall in love with him. But then, she is called to be a nun and I am not. But I would love to know Jesus’ love deeply, to drink deeply of Jesus, to breathe Jesus. She shows me a music video she has, an American worship song, showing Jesus standing by, walking with people in all their activities, crying with them, rejoicing with them. He looks so beautiful in that video. I’ll have to ask her to send it to my email address. She and Aowny are so incredibly suspicious of Obama. Their suspicion makes me doubt. Does he mean well for Egypt? For this continent? For Israel? Or is he really supporting the Muslim Brotherhood, as they say? I can’t imagine him choosing to do such a thing. They both see a dark future for Egypt. I think Aowny would love to leave Egypt, if only he could. But Elleria has chosen to stay here, in Egypt, with her sisters.